Read all the things we think about landscape..
watching the 2008 movie Quarantine the other night, I felt my first authentic fear of zombies. I started experiencing the basic status-quo terror of zombies as a 9-year-old, when, having moved from Northern California to a remote property in Southern Oregon, I created a fantasy that zombies began shuffling up our gravel driveway whenever I rested my hands over my stomach in bed at night. I realize that this makes no sense, but hey I was nine. I had the only room in the cabin, being the one girl in the family. This was great for privacy, and for displaying my doll collection across an entire wall of shelves decorated as a doll house. But the room had a door leading out into the wilderness with a large single-pane window and a fork through the latch. Yes, a fork, we were poor; get over it. I used to shudder within the first two seconds of reaching up to cup my face with my hands and press my nose against the cold glass to peer into the blackness at night. And I would back away into the light of my room and pretend I’d never seen that dark nightscape. What I thought was so powerful about Quarantine was that it added to the idea put forth by 28 Days Later of a zombie scenario stemming from disease, a plausible source for such an outbreak. It seems to me that the popularity of zombies as an apocalypse scenario is due in part to the collective consciousness agreement that it could never really happen. If zombies were real, we’d all be so so in trouble, and life would be a terrifying ordeal as well as a lot shorter. The last thing anyone would enjoy is watching video of the real thing. No, we’re hooked as a culture because we can snuggle into our couches and scarf popcorn, knowing that we’ll never actually have to deal with that particular hell on Earth. Think about it. If “terrorists” or the government or the military or a corporation or coalition of corporations decided to gain (more) control of the population, then it would perhaps not be too difficult to engineer and release an “apocalypse virus” like in the film Quarantine. So what am I telling you? I’m suggesting that for a moment you stare straight into the blackness of the idea that a zombie apocalypse could actually happen in real life, and then come back into the light and tell me what you saw. Maybe plant a Permaculture garden. Buy a hand-held poker and grind the tip to a point. Sit down and start writing letters to Congress and the Senate about corporate accountability, factory farm reform, and campaign finance reform. Do something to become more sustainable, self-reliant, and able to help others in a crisis. Now, for the fun stuff. 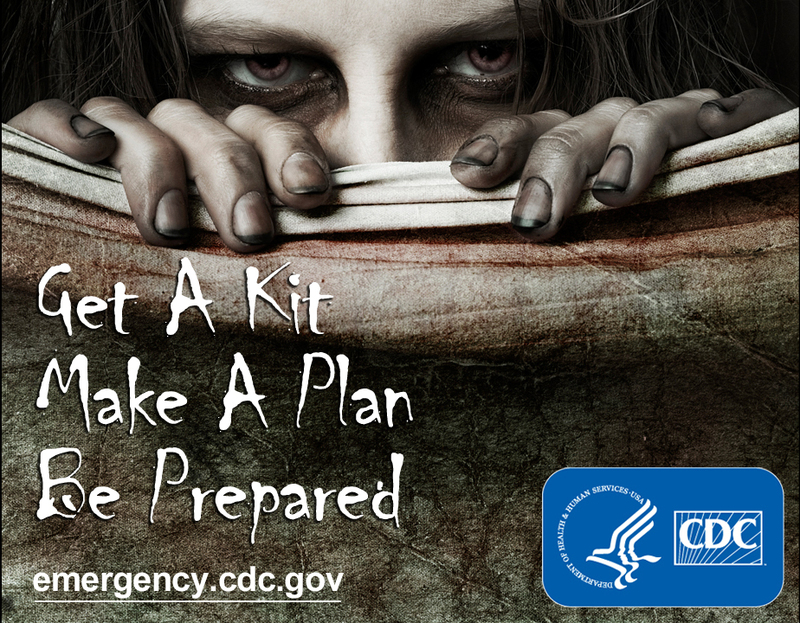 The Center for Disease Control actually published a guide for zombie survival! This is wonderfully ridiculous but perhaps kind of strange as well. The CDC isn’t supposed to have a sense of humor! My opinion is that the governmental organization officially in charge of disease prevention and control for the United States of America writing a zombie survival guide on its website does not bode particularly well in terms of what may lie ahead. Maybe I will finally go out and buy some emergency supplies this Halloween along with a bad wig and fake eyelashes. Perhaps one of the things we’ll all need to survive anything really, from a typical day in America to some kind of horrible breakdown of society, is a big smile and a chuckle. If the CDC can express such a fantastic sense of humor, such a break from standard official seriousness, maybe they are stressed out, or perhaps we’d all benefit from a little comedy to go with our spooky fantasies this Halloween.